38 1/2 x 64 1/8 inches (98 x 163 cm) Manchester City Art Galleries, Manchester, UKHylas and the Nymphs originates from Greek myth. As the legend goes King Hylas was on an expedition when he decided to go ashore to get some water. When he reached into a spring to retrieve it he was carried off by water nymphs, never to be seen again. 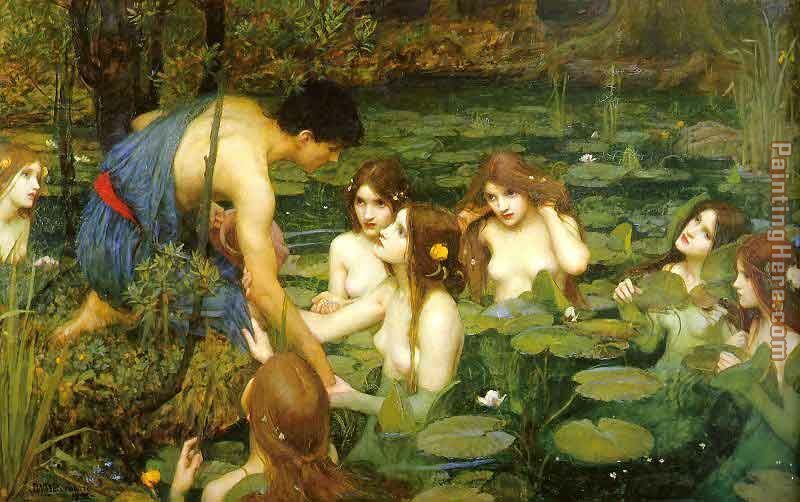 (encyclopedia.org) Waterhouse portrays King Hylas surrounded by seven nymphs. Enraptured with their beauty he is unaware of the fate about to befall him. This painting has a similar theme to La Belle Dam Sans Mercie. Both paintings depict the Femme Fatale, a common theme in Victorian literature and paintings, where the beauty of a woman causes a man to be off his guard, leading ultimately to his death. Beauty and the sense of immediate danger in both these pieces have grabbed viewers for the last century. Many of Waterhouse’s most famous images share the same tie of impending doom. Images including The Lady of Shallot, La Belle Dam Sans Mercie, Ophelia, Mariamne Leaving the Judgment Seat of Herod, Saint Cecilia and Hylas and the Nymphs. “Often in Waterhouse we see a bitter-sweet tension between earthly beauty and impending doom.” Beautiful, original hand-painted artwork in your home. Interpreted paintings based on the masters' works of John William Waterhouse.This Hylas and the Nymphs needs about 14 - 16days for production by a talented artist. If you're not happy with John William Waterhouse Hylas and the Nymphs that you made on PaintingHere.com, for any reason, you can return it to us within 50 days of the order date. As soon as it arrives, we'll issue a full refund for the entire purchase price. Please note - PaintingHere.com does not reimburse the outgoing or return shipping charges unless the return is due to a defect in quality. If you want to purchase museum quality Hylas and the Nymphs at discount price, why not give us a try? You will save a lot more! This John William Waterhouse Hylas and the Nymphs needs 14 -18 days for production time frame. We ship all over the world. We can provide Hylas and the Nymphs Painting stretched canvas and large framed art.